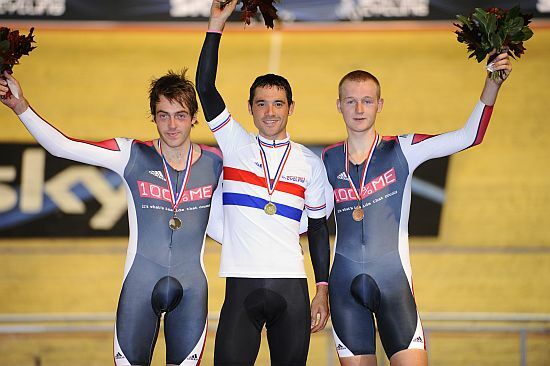 The men's Scratch race was set alight from the off by a solo attack by Alex Dowsett. The field were in no mood to let him go, but the tempo of the race had been set. Attack after attack came and went with everything countered, to start with. Finally, a brief lull led to a brilliant burst off the front from Chris Newton who was then joined by Jon Mould and Ben Swift. Ed Clancy then burst clear to join them, with the field fragmenting behind them. Sam Harrison also joined the leaders to make it five at the front. The main field then split into two, the leading half joining with the leaders to form two distinct groups. Newton wasn't satisfied and went again with Alex Dowsett for company. Again the lead group broke up as Clancy, Evan Oliphant, Mark Christian and Ben Swift went off after the leading duo. An elite group of six then formed about a third of a lap clear. Even now, the action didn't relent and Christian drove them on to join with the back of the main field. Newton went again, looking for a second lap's advantage. But with the lapped riders leaving the track, it all came back together with some 25 laps left to go. With 12 riders still in the race, things were far from settled. Young Welshman Sam Harrison chanced his arm off the front, showing his determination and class. 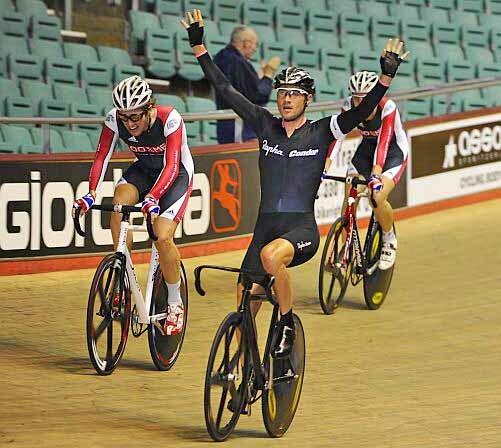 Newton also kept up the pressure, along with Evan Oliphant and Ed Clancy. Christian and Dowsett then went with 9 laps to go, the 100% ME duo building a gap before being joined off the front by Chris Newton, Ben Swift and Ed Clancy. Another awesome burst took Dowsett, Christian and then Newton clear with 2 laps to go and it was the ageless Newton who took the front and hung on to win from Dowsett, with Christin close on his heels. Swift came in a few lengths down in fourth. After the race, Newton said "I saved myself with six to go and when Alex went I thought everyone was gassed. The finish was perfect and really suited my style of riding." He admitted he'd felt good in qualifying, but that he knew he'd have a tough race on his hands, "looking at the line-up with Ed and Swifty, who are fast finishers and Alex." He concluded with a typically professional comment that " you have to turn up and put in a good ride - it's been perfect preparation for the World Cup!"